Oakville Towne Square is part of the Downtown Oakville Business Improvement Area. 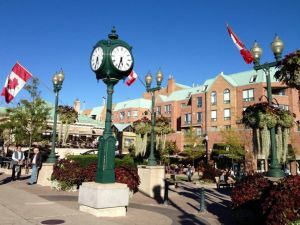 The Downtown Oakville Business Improvement Area (BIA) is a non-profit organization dedicated to improving the economic health and quality of life in Downtown Oakville. The BIA works to create the best possible environment in which to work, shop, live and visit. Downtown Oakville is a dynamic shopping and cultural district. It is recognized for it’s outstanding retail mix, professional services and exceptional dining and is rich in history and heritage. The Downtown Oakville BIA encompasses six city blocks and is the home to over 350 business members. Downtown Oakville Business Improvement Area (BIA) is responsible for marketing and beautification of this historic business district. Currently the BIA operates a marketing committee and events committees for two events; Midnight Madness and the Downtown Oakville Jazz Festival and comprised of volunteers from the Downtown Oakville BIA businesses. The Board Of Directors of the Downtown Oakville BIA are elected Members of the Downtown Business Community and responsible for creating the annual Business Plan to drive traffic to the area. Funds are collected from each Business Member as a percentage of the taxed assessed value of their facility. The Town Council does not contribute to this budget, directly. The Town Council acts as the “collection agency” and provides guidance and ensures good Governance for this not for Profit Association.